We've all heard of Hogwarts sorting communities. 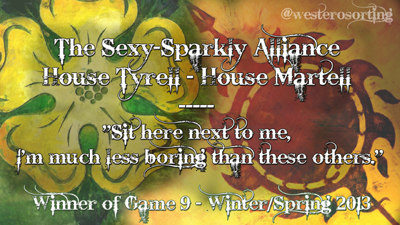 Isn't it time we had the same kind of fun over in Westeros? Well thanks to community founders cyshobbitlass, deeplyunhip, and honest_illusion, we can do exactly that. 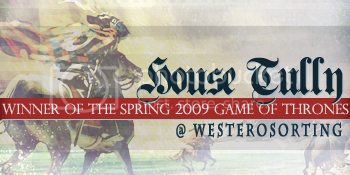 In this community, you'll be able to find out which major Westeros house best fits your personality after filling out an application. That's only the beginning. After being "sorted", you will be able to join your House's community (as well as the general community and various other sub-communities) and work on winning the Game of Thrones. 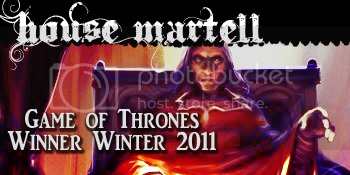 Your moderators are misstopia (Lord Commander), missyquill (Lannister), rebel (Lannister), jesatria (Martell), alenky_cveto4ek (Stark), muku_muku (Stark), mauvais_pli (Targaryen), ikel89 (Targaryen), kibethsbark (Tully), moryssa (Tully), moderntrickster (Tully), hamsterwoman (Tyrell) and sephystabbity (Tyrell). 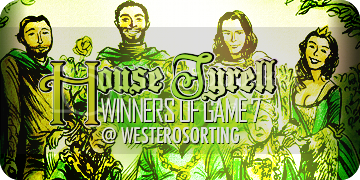 Be sure to check out the Westeros Sorting FAQ if you have questions! 1. You must be 16 years of age or older to join this community due to the nature of the series. 3. When filling out the application, please be as thorough as possible. It will be quite difficult to sort you if you do not give us enough information about yourself. Writing too much is simply not possible! The more the better! Also, please be honest. "Pushing" for a certain house is a pet peeve of the mods here and if we feel that you are doing this (or if other voters feel this way), you will be asked to re-apply. In this case, you can re-apply as often/whenever you would like to. Please avoid making major changes in your application after posting it. If you do, be prepared to inform your sorters. Last but not the least, plagiarism is also strictly forbidden. 4. Please please capitalize your house name and put it in brackets in the subject line when voting, e.g. [TULLY]. If you are using a Livejournal style that does not show comment subject lines, please bold it in addition and put it at the top of your comment, i.e. [TULLY]. This makes it easier for us mods to keep track of your house points. ;) You do earn points by sorting. If you are applying, you may not argue with the votes you receive, through comments or anything. This can easily be perceived as pushing, so we have had problems with this and would like to avoid them in the future. You may also give someone No Vote if you feel that they have not elaborated enough, or if you feel that they have been pushy or dishonest in their application. Please elaborate as much as possible when voting. People will often be more interested in your reasoning than in your actual vote. If you are wondering why your application isn't posted yet, please keep in mind that we only release a maximum of seven applications a week. 5. Please put the words "win or die" in the Subject, to show us that you've read the rules. 6. This is more than just a stamping community (don't get me wrong, though - we love stamping communities!). Much like the popular HP sorting communities, you'll be able to join a House community after you've been sorted. From there, you'll be able to participate in all sorts of activities (in various subcommunities) in order to win points for your house. 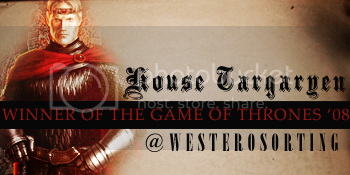 The House with the most points for a designated period will be the winner of the "Game of Thrones". If you'd like to get more involved, you are also free to apply to be a member of the Night's Watch, the mod community. We'll take as much assistance as we can get and no worries - you can easily be a member of a House as well as member of the Night's Watch. 7. 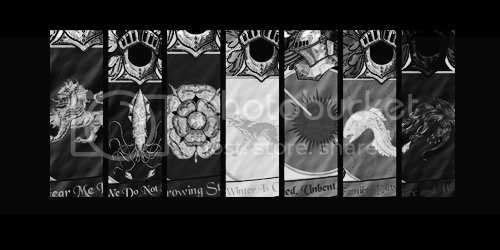 Promotion of other ASOIAF communities or other sorting communities is perfectly fine. Share the love. Please, please, please just upload the promo banners/stamp in your own servers. :) You may use this banner for promotion. 8. For questions, concerns, etc., please send a message to misstopia or post them here. We'll get back to you ASAP. 9. Most importantly, have fun! That's the real point here. ;) Keep the drama and the bashing and all that nasty stuff out of the comm please. Also, if you are confused about how you should answer some of the questions on the application, please check this example for reference. If you are having problems writing your application because English is not your first language, or if you would like help with grammar, please go here. Art by Amok. Banner by honest_illusion. Art by Tomasz Jedruszek. Banner by misstopia. Art by zweihand, cloud_wolf and regendy. Banner by angerfish. Art by Tomasz Jedruszek. 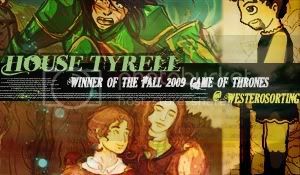 Banner by greyfable. Art by Cecilia Latella/ cabepfir. Banner by chacusha. Art by by guad (stained glass window) and Michael Komarck (Jaime). Banner by sephystabbity. 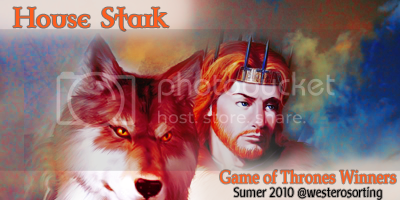 sane_asoiaf_fan - Stop the madness! jaimexbrienne - if you like Jaime/Brienne, then duh, join this community!